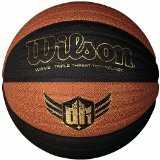 Wilson basketballs are the official game ball of the NCAA. Many of them are also approved by the NFHS for high school competition. They come in all basketball sizes, are built for all indoor and outdoor playing surfaces, and can be found in a variety of colors. Wilson even makes a glow-in-the-dark basketball for some fun night-time hoops action! The first step in purchasing a ball is to select the right size for your youngster. Once you've determined the size of ball you need, it's time to select the type of ball you want. You have a choice between leather, composite, and rubber basketballs. Not sure what you're looking for? Wave design - Grooves are cut into the covering to create ridges for better ball control. Laid in channels - Unique Aqua-Grip channels made with pebbled composite leather replace traditional rubber for improved "grip-ability." Moisture absorbing - Patented technology keeps moisture away from players' hands. Cushion core technology – Combination of low-density sponge rubber and ultra-durable butyl rubber produce an exceptional feel. Are you a Derrick Rose fan? Here's a basketball just for you! 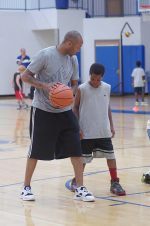 D. Rose, the 2011 MVP, former NBA Rookie of the Year, and NBA All Star has worked with the designers at Wilson to come up with the D. Rose Signature Line of Basketballs. Each ball features the D. Rose signature and unique panel design and graphics. In commemoration of his MVP honor, D. Rose fans have been offered an unprecedented opportunity to choose which Limited Edition Derrick Rose MVP Basketball will go into production. How about purchasing a high-quality basketball and supporting a great cause at the same time? Wilson is a proud participant in the WBCA Pink Zone® initiative. Join college coaches in a global effort to raise breast cancer awareness on the court, across their campuses, in their communities, and beyond. The official charity of the WBCA Pink Zone® is the Kay Yow Cancer Fund™. Kay Yow was an amazing women's basketball coach at NC State who lost a long, brave battle to cancer.